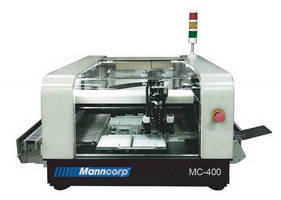 Bring prototyping, short run and low volume printed circuit board assembly jobs-even those requiring considerable placement accuracy and precision-in-house with the new MC-400 benchtop pick & place machine from Manncorp. Also suited to design houses and contract manufacturers who are looking to offer first article approval and small batch production to their customers, MC-400 offers the quality build and features of Manncorp's full-sized MC-series machines at a more affordable price point. A combination of on-the-fly and stationary Cognex®-based alignment systems ensure accurate placement of 0201s through 100 x 150 mm SMDs, including BGAs, CSPs, flip chips, QFPs, odd-form components, and ultra-fine-pitch parts to 15 mil. With the MC-400's AC servo motion control and linear encoders, placement rates of 2,500 cph (IPC 9850) can be reached with ±0.05 mm placement accuracy and ±0.01 mm repeatability. Components can be picked from tape reel, cut strip tapes, sticks and waffle trays. Nine possible feeder configurations can be viewed on the product's web page at www.manncorp.com/pick-and-place/mc400/ MC-400's time-saving, error-proofing Smart Feeders are interchangeable with all other MC-series pick & place machines. MC-400 uses the full MC-series software, with expandable component library, universal CAD data import, teach-in programming, and Virtual PCB Simulation for program verification. Programs are portable between MC-series machines, allowing manufacturers to move from prototyping to high-volume production without reprogramming. Remote service and support are included, along with a two-year parts warranty. Installation and onsite-training, provided by Manncorp's own technicians, most of whom have been with the company for over a decade, are available to get the MC-400 up and running for your specific needs as quickly and smoothly as possible. Manncorp offers a no-obligation Requirements Evaluation to help assemblers determine which pick & place equipment is best suited to their workload. Simply send a typical BOM (bill of materials) to sales@manncorp.com or contact one of Manncorp's sales and support offices: 800-PIK-MANN (745-6266) for the East Coast office; 888-PIK-MANN (745-6266) for West; and 52-1-656-217-8215 for Mexico.